It SAYS that the minimum here is 250 pcs., but if you only need them BLANK we can sell them in a quantity as low as 100 pcs. ​These customized 6 function keychain tool pocket knives arrive at your door printed with your one color logo. These tools are both compact and convenient, whether you need to open a package quickly or pick that hunk of meat out of your teeth after visiting your favorite steakhouse with the built in toothpick. 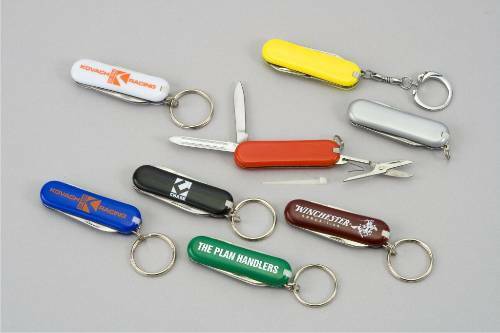 These custom promotional pocket knife keychains also feature scissors, tweezers, a file, and also function as a key holder. I mean, obviously, as these are a keychain. If you work in the camping, hunting, paintball, or outdoor industries, these customized keychain pocket knives are a no brainer. Basically these would be helpful to just about anyone who doesn't have to pass through an airport all the time. As if all of the great features of these custom logo pocket keychain tools don't make them enough of an attractive buy, these imprinted keychain pocket knife tools are made from 100% recyclable materials! FREE SHIPPING, what you see is what you pay!